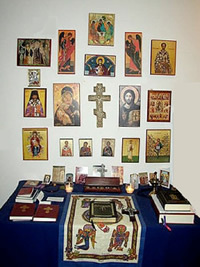 Every home should have an area which is used for family prayer and is set up with a cross and various icons. The home of the faithful is known as the domestic church and the icon corner is the main place the family gathers to pray together. This place is essential in the faith formation of the children. Saints Cyril and Methodius church supports the family in religious education and has a library full of books from which parishioners may choose.